Adept PDF Password Remover can be used to decrypt protected PDF files, which have "owner" password set, preventing the file from editing (changing), printing, selecting text and graphics (and copying them into the Clipboard), or adding/changing annotations and form fields. PDF decrypt is being done instantly. 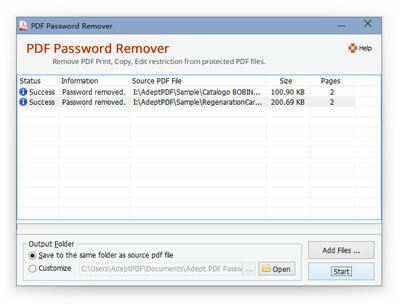 Adept PDF Password Remover is designed to remove the password and restrictions (Owner Password) of PDF files. 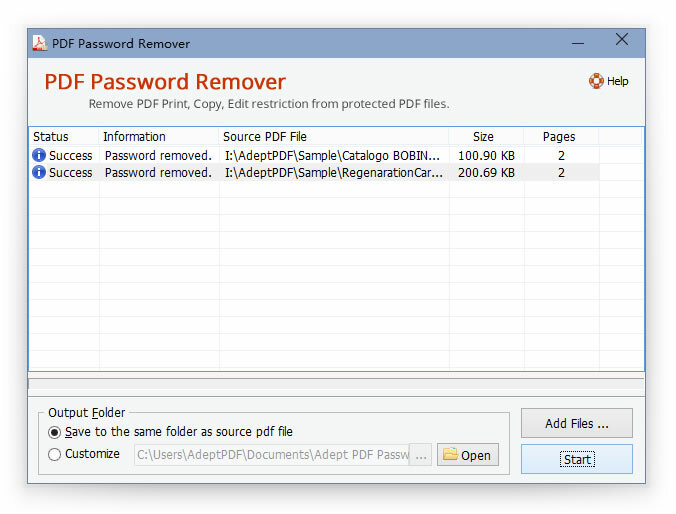 Drag & Drop the PDF file to Adept PDF Password Remover main form, the restrictions will be removed in seconds. It is easy for you to copy, edit or print the PDF files after decryption. Support Windows XP, 2003, Windows Vista, Windows 7, Windows 8 and Windows 10.